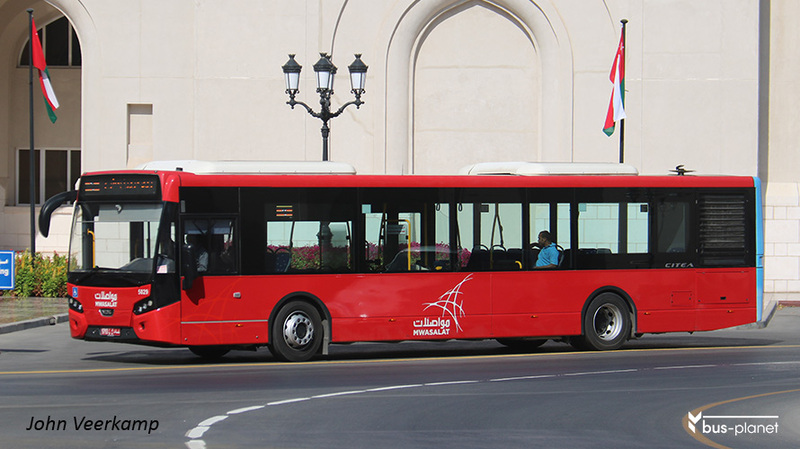 In October 2015 ONTC (Oman National Transport Company) was rebranded as Mwasalat (= transport). A new livery of allover red for city buses and red and white for coaches was introduced. Together with the change of its image new buses were introduced and started operating on November 22: 40 VDL Citea SLF low-floor city buses from The Netherlands and 10 Turkish-built Mercedes-Benz Tourismo for the coach division. A new website provides information on the company and its services. In 2016 dedicated bus lanes will be opened and the fleet will be further increased. It is also announced that within seven years there will be a light rail system in Muscat. Beginning of February 2018 a batch of new MAN Lion’s City buses was put into service, series 8000. Probably in 2017 new MAN Lion’s Coach vehicles entered service, numbered in the 7000-series. 30 VDL Citea LLE 10-meter buses have been ordered for 2018, with the prototype shipped end of 2017.